This name of sinister memory derives from one of the church calendar’s great autumnal feast, Michaelmas — and the sword-arm of its titular archangel would have been required to keep the peace between the rival religionists in the Languedoc. Nimes went heavily for the Protestants, with the region’s royal governors unable to restrain the conquest of Catholic neighborhoods and churches by the predominant Huguenots through the 1560s: “the very wind which blew upon Nimes breathed heresy,” in the words of Dumas. The years running up to our events of 1567 feature one of the numerous rancorous truces pocking France’s intractable Wars of Religion: this one is known as the “Armed Peace”, which gives you an idea where everyone’s heads were at. And in Nimes, the heresy in the wind was not such as to prevent the restoration of Catholic authorities to control of the civic institutions — to the undoubted irritation of the Huguenot grandees who endured the indignity of displacement alongside the sure knowledge of the popular weight that supported them. This ripening conflict appropriately came to fruition via a vegetable market at a city fair on Michaelmas — September 29, 1567 — where an altercation turned into a sectarian riot and soon transformed into a municipal Protestant insurrection. Huguenots still maintaining the preponderance of force in Nimes, they perpetrated the expected outrages during the excitement: sacking the cathedral, murdering some particularly hated Catholics. But the overall organization of the Huguenots and the organized participation of the city’s Huguenot elites suggests a good deal of advance orchestration, and perhaps coordination with the Huguenot attempt to kidnap the king just days before. Captive Catholics were detained in several buildings around the city, notably in the city hall. It is not known to what extent the kill lists to cull from these unfortunates were preordained and to what extent they were improvised in the moment, but on the night of September 30, summons for specific victims went out, and Protestant squads complied by dragging them out of the city hall basement or wherever else they were held to the courtyard of the bishop’s palace. This would be the makeshift abattoir. when night came the large number of prisoners so imprudently taken began to be felt as an encumbrance by the insurgent chiefs, who therefore resolved to take advantage of the darkness to get rid of them without causing too much excitement in the city. They were therefore gathered together from the various houses in which they had been confined, and were brought to a large hall in the Hotel de Ville, capable of containing from four to five hundred persons, and which was soon full. An irregular tribunal arrogating to itself powers of life and death was formed, and a clerk was appointed to register its decrees. A list of all the prisoners was given him, a cross placed before a name indicating that its bearer was condemned to death, and, list in hand, he went from group to group calling out the names distinguished by the fatal sign. Those thus sorted out were then conducted to a spot which had been chosen beforehand as the place of execution. This was the palace courtyard in the middle of which yawned a well twenty-four feet in circumference and fifty deep. The fanatics thus found a grave ready-digged as it were to their hand, and to save time, made use of it. 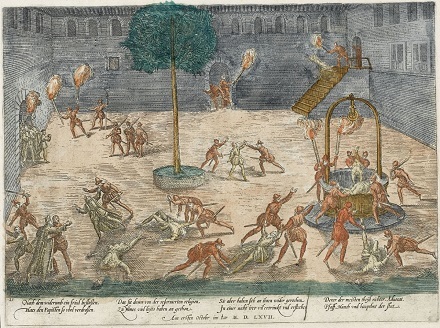 The unfortunate Catholics, led thither in groups, were either stabbed with daggers or mutilated with axes, and the bodies thrown down the well. Guy-Rochette was one of the first to be dragged up. For himself he asked neither mercy nor favour, but he begged that the life of his young brother might be spared, whose only crime was the bond of blood which united them; but the assassins, paying no heed to his prayers, struck down both man and boy and flung them into the well. The corpse of the vicar-general, who had been killed the day before, was in its turn dragged thither by a rope and added to the others. All night the massacre went on, the crimsoned water rising in the well as corpse after corpse was thrown in, till, at break of day, it overflowed, one hundred and twenty bodies being then hidden in its depths. Dumas is indulging poetic exaggeration of the scene, and later estimations of the number of victims range well below 120 — but Tulchin quotes a leather worker who saw the courtyard on the following day and described it as “all covered with blood and the water of the well all red.” Even “merely” twenty or thirty victims slashed to death would have been a gory work. In the days following, Huguenots would cement their control of Nimes with the systematic pillage of churches and (after a six-week siege) the capture of the city’s royal garrison. There was no general massacre after the Michelade; in the main, Catholics were forced into submission or exile instead of the grave. But the effusion, combined with Huguenot attacks further north, helped to trigger the (very brief) “Second War” within the Wars of Religion which gave way after a short truce to the much bloodier “Third War” of 1568-1570 … whose peace would be broken by a Catholic sectarian massacre much better remembered to history than the Michelade. 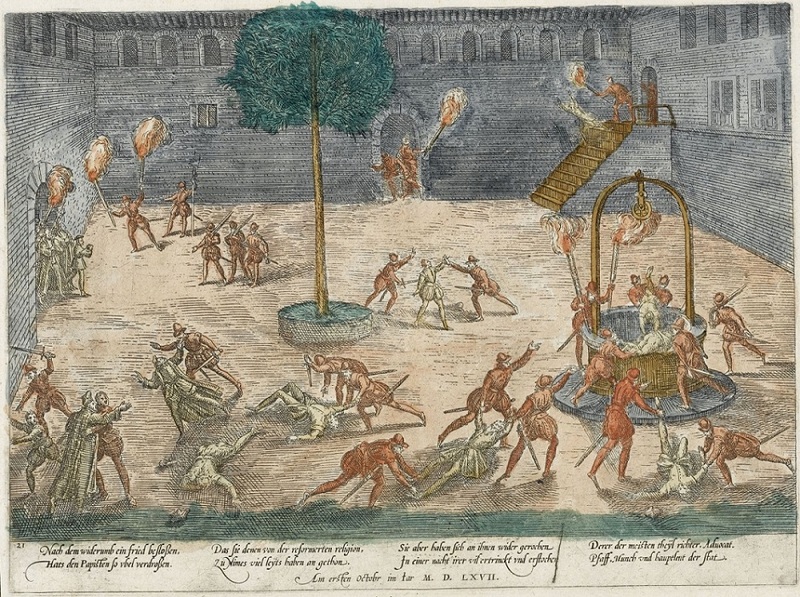 On this date in 1567, four Anabaptists were burned at Antwerp as heretics. Their sect furnishes many martyrs for these pages. That Christian Langedul, Cornelis Claess, Mattheus de Vick, and Hans Symons were sniffed out and clapped in prison for their faith is no surprise for the time and place they lived, and that they withstood torture and went joyfully to the stake is the script demanded for historical remembrance. Letters in the hands of three of these men (all save Mattheus de Vick) were retained by their comrades and eventually published in the Martyrs Mirror chronicle of Protestant (especially Anabaptist) martyrs during the Reformation. Hans Symons and Cornelis Claess wrote words of exhortation to faithfulness and steadfastness. Christian Langedul’s letter, however, catches our eye for its very direct exposition of the nature of the torture that he and the others were put to. In a letter to his wife, Langedul doesn’t sugar-coat his situation in the least — and she must have known full well what their arrest would entail. Centuries later, it’s a discomfiting first-person account of what a man suffers on and after the rack. we were all examined today before the margrave, and of us six we four freely confessed our faith, for it had to be; either the soul or the body had to be sacrificed; the Lord had to be either forsaken or confessed. Thus, Hans Symons, Cornelis the shoemaker, and Mattheus, confessed as also, I unworthy one, and I hope to keep it to the praise of the Lord, but not through my own power or merit, but by the power and grace of God; for through weakness we are made strong, this I must confess. Eph. 1:19; II Cor. 12:9. Hence be of good cheer in the Lord, and do the best with the children, of whom I dare not think, for they lie heavily on my heart. I replied that I knew nothing to say about infant baptism; but this did not suffice, I had to confess that I had received another, and thus I confessed it, the Lord be praised, and I have not regretted it yet, and I hope that I shall not regret it unto the end, for it is the truth. Know, my beloved wife, that yesterday about three o’clock I had written you a letter, which I now send you. I could not send it then, for soon afterwards the margrave came here to torture us; hence I was not able to send the letter, for then all four of us were one after another severely tortured, so that we have now but little inclination to write; however, we cannot forbear, we must write to you. Cornelis the shoemaker was the first; then came Hans Symons, with whom also the captain went down into the torture chamber. Then thought I, “We shall have a hard time of it; to satisfy him.” My turn came next — you may think how I felt. When I came to the rack, where were the lords, the order was, “Strip yourself, or tell where you live.” I looked distressed, as may be imagined. I then said, “Will you ask me nothing further then?” They were silent. Then thought I, “I see well enough what it means, it would not exempt me from the torture,” hence I undressed, and fully resigned myself to the Lord: to die. Then they racked me dreadfully, twisting off two cords, I believe, on my thighs and shins; they stretched me out, and poured much water into my body and my nose, and also on my heart. Then they released me, and asked, “Will you not yet tell it?” They entreated me, and again they spoke harshly to me; but I did not open my mouth, so firmly had God closed it. Then they said, “Go at him again, and this with a vengeance.” This they also did, and cried, “Go on, go on, stretch him another foot.” Then thought I, “You can only kill me.” And thus stretched out, with cords twisted around my head, chin, thighs, and shins, they left me lie, and said, “Tell, tell.” … Again I was asked, “Will you not tell it?” I did not open my mouth. Then they said, “Tell us where you live; your wife and children, at all events, are all gone away.” In short, I said not a word.”What a dreadful thing,” they said. Thus the Lord kept my lips, so that I did not open them; and they released me, when they had long tried to make me speak. Thereupon two of them, the executioner and his assistant, bore me from the rack. Think how they dealt with us, and how we felt, and still feel. Then they half carried, half dragged me from the torture chamber up into the jailer’s room, where was a good fire of oak wood. There they, once or twice, gave me some Rhenish wine to drink, which revived me in a measure. And when I had warmed myself somewhat, they again half dragged me up over the porter’s room. There they had such commiseration for me; they gave me wine again; they gave me spices, and of everything you had sent me, all of which rendered me very good service. They had wine brought and helped me to bed. But the sheets were very coarse, and greatly hurt my shins and thighs; however, soon afterwards the sheets and pillow you sent me arrived, and there were also two or three pocket handkerchiefs. They then covered me with the sheets, which came very convenient to me, as did also the spices. Had the sheets not come, I know not how I should have passed the night; but so I slept tolerably well. But I am hardly able to stand yet, and the lower part of my legs is as though they were dead from racking; however, it is all well, as I trust by the grace of the Lord. After me Mattheus was tortured; he named his house and the street in which we live, and said it was in a gate; however, I am of the opinion that there are no longer any gates in that street. Hence move away altogether, if you have not done so yet; for I think the lord will find his way there. Let therefore no one who stands in any danger go into the house. He also named R. T.’s house, and the street where F. V. St. lives. Do herein immediately the best you can. He is very sorry for it. I wrote you yesterday that I hoped to write to you during the day, but I could not do it; Mattheus and I lay in bed until two o’clock, so greatly were we afraid, because the margrave came here to torture Cornelis again, and we feared that we should also be tortured a second time, of which we had a great dread, more than of death, for it is an excruciating pain. Cornelis was tortured and scourged to such a degree the second time, that three men had to carry him up, and they say that he could scarcely move a member, except his tongue. He sent word to us, that if they come again it is his opinion it will finish him. Thus the Margrave did not come yesterday, but we expect him today again; may the Lord help us, for it is a horrible pain. On this date* in 1567, Florentine humanist Pietro Carnesecchi was burned after beheading at the Ponte Sant’Angelo in Rome. 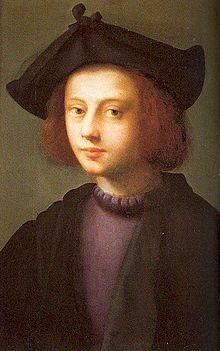 Carnesecchi (English Wikipedia entry | Italian) was born to a wealthy Florentine merchant family allied with the Medici; as a child, Carnesecchi probably dandled the infant Cosimo, the future ruler of the city. His education was patronized by the Medici cardinal who went on to become Pope Clement VII. All these friends in high places would prove in time to be a poisoned chalice. But the young man was in his glory in his twenties at Clement’s papal court, as notary and protonotary, excelling in his lucrative sinecures on the curial cursus honorum. To his grief and/or glory, he met along the way the Spanish reformer Juan de Valdes, who had taken refuge in Naples from the Spanish Inquisition, and the spellbinding pulpit orator Bernardino Ochino, who was by the late 1530s to trend towards outright apostasy. Intellectual curiosity was a quality dangerous to its owners during the Reformation. Carnesecchi had his own insider’s view of the Church’s warts to add to the influences of these brilliant associates, and by the 1540s was obliged by his affinities to seek his safety in the more liberal religious environment of Venice … and later, after a close first brush with the Roman Inquisition, to leave Italy altogether. He wasn’t on the run per se, but his was a contingent life: a few years in a place, with the ever-present peril that a shift in the political winds could see him or his friends to the scaffold. He returned from France to Venice in 1552, spurned a summons to justify himself once more to the Inquisition under the furiously anti-Protestant Pope Paul IV, and was even able to move back to the Eternal City with the accession to St. Peter’s Throne of another Medici cardinal as Pope Pius IV. The Inquisition, nevertheless, drug its feet when it came to acquitting Carnesecchi once again. “Nothing progresses!” he cries in one of his letters, for the Inquisitors “will not judge as right and duty dictate, for they suggest scrupulous hesitancy where there is no ground for it, and interpret that prejudicially which, rightly apprehended, is good and praiseworthy.” In other words: prosecutors. As Popes are said to alternate fat with thin, and old with young, here they traded zealot of the faith with mellow humanist. When Pius IV died, the pendulum swung back against Pietro and the relentlessly orthodox** Pius V took charge. Carnesecchi took refuge in his native Florence, governed by that baby Cosimo de’ Medici, all grown up now into an authoritarian state-builder. Cosimo had welcomed him before, and interceded on his behalf in the last go-round with the Inquisition; Florence, moreover, had a long-running rivalry with Rome in peninsular politics. Carnesecchi would have supposed himself as safe there as ever he had been in his peregrinations. Hauled immediately to a Vatican dungeon, Carnesecchi spent his last 15 months in prison, under interrogation, and sometimes on the rack. “They would fain have me say of the living and of the dead things which I do not know, and which they would so fain hear,” Carnesecchi pleaded in (futile, intercepted) letters to old associates from the Curia. He admirably refused to incriminate anyone, but was convicted in September 1567 on 34 counts of obstinate heresy. They can all be read here — headlined by that hallmark of rank Protestantism, justification by faith alone. Carnesecchi was stripped of his ecclesiastical ranks and his property, and turned over to the secular arm — the latter hypocritically “beseech[ed] … to mitigate the severity of your sentence with respect to his body, that there may be no anger of death or of shedding of blood,” which was, of course, the very intent and the effect of turning him over. Carnesecchi met his fate sturdily; his Catholic confessor complained that he was more interested in bantering ideas than penitence for his wrong opinions, and showed no proper fear of death. In 1569, Pius V bestowed the title of Grand Duke of Tuscany on Cosimo. Carnesecchi, long obscure to posterity, was exhumed almost literally when the Napoleonic Wars gave anti-clerical factions the opportunity to ransack secret Roman Inquisition archives. His meter-long file passed into a succession of private hands and was finally published in the mid-19th century, and as a result there are several public-domain volumes about the heretic in addition to the one we have already cited. Some of the original documents, with English translation, can be read in this volume; Italian speakers might give this one a go. * There are a few citations out there for October 3. I can’t find a definitive primary source, and it may be that the original records are themselves ambiguous, so I’m going with the bulk of the modern and academic citations in favor of October 1. ** Anglos may recognize Pius V as the pope whose bull explicitly releasing Catholics from their allegiance to Queen Elizabeth put English followers of the Old Faith in an untenable position, much to the grisly profit of this here blog. On this date in 1567, Wilhelm von Grumbach was dismembered along with two of his followers in the marketplace of Gotha. Grumbach (English Wikipedia entry | German) was the cantankerous German instigator of the aptly-named Grumbachsche Handel, a messy clash of rights and prerogatives at the hinge of the old feudal order and centralized princely authority. Grumbach was a knight who’s invariably described as an “adventurer”. As a young man he fought in the Peasants War, but as he headed into middle age he became your basic penniless minor nobleman chafing at the failures and obstructed opportunities life threw at him. The standing right for miscellaneous minor lords to start miscellaneous private wars was quite naturally one that princes were ever keen to restrict. After centuries of two-steps-forward, one-step-back efforts to deal with the feud, the 1495 Imperial Diet formally codified a ban on feuding known as the Ewiger Landfriede, or “perpetual peace”. In Poli Sci 101 terms, this is the state finally monopolizing legitimate violence. As with dueling, however, official proscription did not end the practice. It was, indeed, Grumbach’s defeat and execution that would eventually be remembered as the decisive nail in the coffin for knightly feuds. Knights’ basic problem — the reason they were vulnerable to losing their wacky old-time rights — was poverty, and it was in money that Grumbach’s feud was rooted. Grumbach’s personal twist on this was being the sort of irascible coot who could carry a grudge so far as to get himself sawed into pieces over it. 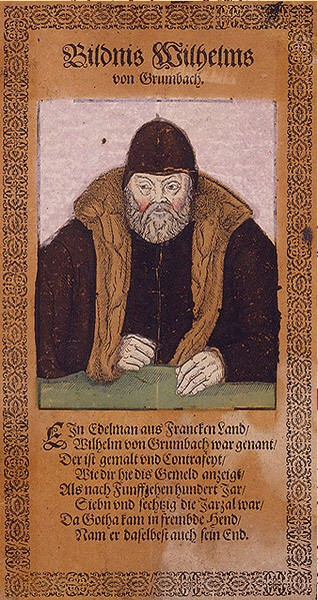 Immediately upon assuming the Prince-Bishopric in 1544, Melchior Zobel von Giebelstadt forced Grumbach to return an unauthorized cash gift his predecessor had paid to the knight, and then stiffed said knight out of six villages whose revenues Grumbach sought by way of compensation. He had to deal with Grumbach’s feud for the remainder of his term, which was also the remainder of his life … right up until Grumbach murdered him. The disaffected knight hooked up with the margrave* Albert Alcibiades and started making a right mess in the middle of Europe with a 1552-54 mini-war. When Albert got thumped, Grumbach had to evacuate to France, and his holdings outside Wurzburg were plundered and/or destroyed by his foes. So now the guy was even more aggrieved, and even more pfennigless. He was downright vengeful about his feud at this point, although it’s noteworthy relative to that monopolization-of-violence trend that he was still the only one: in days of yore, intra-elite wars might have spawned multiple self-reproducing vendettas. The grumpy Grumbach now gravitated to another patron,** the deposed elector of Saxony Johann Friedrich II — another dude who felt hard done by in the Holy Roman Empire. But that still left the money, and we know Grumbach wasn’t the type to write off a debt. In 1563, he successfully invaded Wurzburg with 1,300 soldiers and at swordpoint forced from the city a concession restoring his property. For Grumbach, it was to prove a Pyrrhic victory. In principle, he had achieved a great vindication of the ancient right of the feud, and for the hard-pressed nobility against the realms’ many princes. If others of his station had rallied to that banner, what a whirlwind Germany would have reaped. Grumbach was in fact hatching an extravagant scheme† to liberate the entire German nobility … from the yoke of the princes. It was a radical aristocratic utopia … nobles were not only to be protected by the [Holy Roman] emperor from the princes, but to help him subdue them once and for all and to establish an hereditary monarchy in Germany. But despite Grumbach’s best efforts to incite the Franconian nobility, they did not line up behind him. 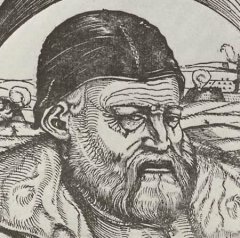 Guidied by the captain of the Franconian Circle (Kreis), Georg Ludwig von Seinsheim, who denounced Grumbach’s undertaking as ‘against God, law and the emperor’, they formally turned away from him in 1564. In the view of the majority of them, the Knighthood was to maintain its autonomy by respecting the equilibrium between emperor and princes, not by irresponsibly challenging the latter. And it was this view, reassuringly transmitted to the princes, which carried the day. The noble right to feud was dead. 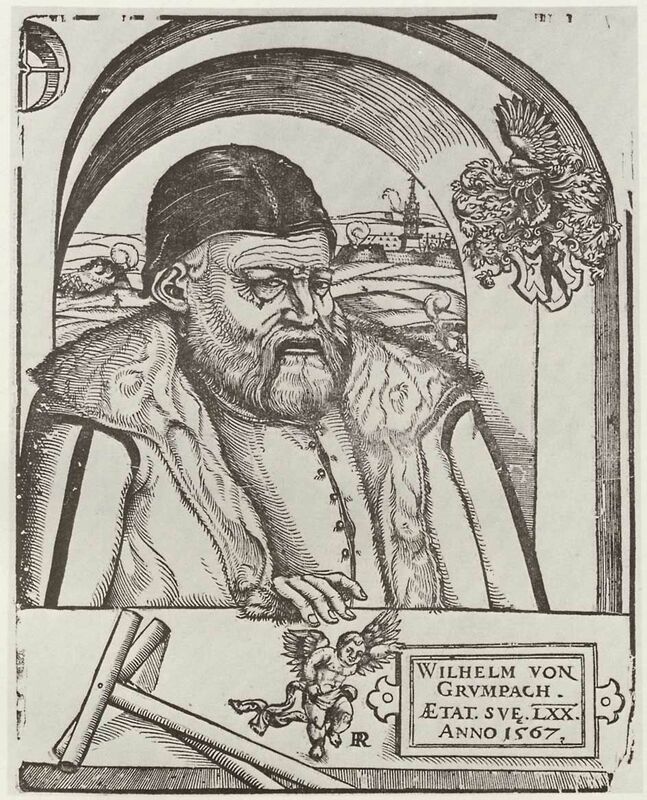 † Christian Wieland writes that Grumbach deployed — unsuccessfully but still impressively — a 16th century multimedia propaganda campaign to state his case to the “common nobleman”: woodblock-illustrated printed leaflets, songs valorizing the attack on Wurzburg (sample verse: “Violence may be averted by violence / According to natural law”).